The Reference Thermapen® thermometer is ideal for comparison checking the calibration and accuracy of other thermometers and probes, when used in conjunction with a stable temperature source. The instruments measure temperature over the range of – 69.99 to 199.99 °C with a resolution of 0.01 °C and an accuracy of ±0.07 °C. 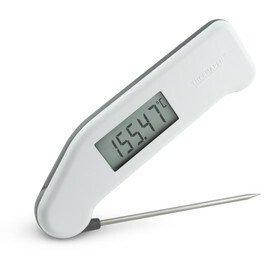 The thermometer will power off automatically after ten minutes, maximizing battery life. This feature can be disabled if not required. Both low battery (icon) and open circuit indication are displayed, when applicable. Each Reference Thermapen® is powered by two lithium coin cell batteries with a minimum life expectancy of 1000 hours. The Reference Thermapen® incorporates a stainless steel, liquid/penetration probe Ø3.3 x 108 mm, that conveniently folds back through 180 degrees into the side of the instrument when not in use.